The WoL client is a great tool and this thread aims to help you in setting it up, using it, and solving some common problems people run into. Hopefully this guide will answer any questions that you have about the client, if you have any further questions don't hesitate to post in the help forum. We will help you with what you need there. The first step in any of this is of course launching the client. 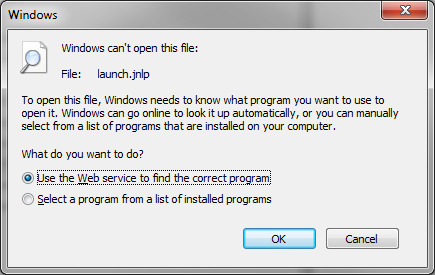 The WoL client runs on Java so if you don't have that installed then that is the first step. 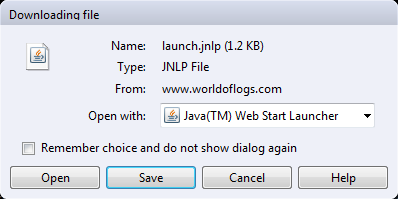 Clicking the Client link on the upper right corner of the site will download a ".jnlp" file that tells Java how to run the client. If you can't see the Client link like above, make sure you are logged in, and your account is associated with a guild. The download process is different between browsers, here are some screenshots from Chrome, Firefox, Opera, and Internet Explorer. If a browser allows you to open the file directly with Java, that is usually easiest. Firefox allows you to either directly open the file with Java, or save it to disk. Opera also allows you to either directly open the file with Java, or save it to disk. If you chose to save the file, simply double click on the file from wherever you saved it. The top part allows the client to login as you and upload reports to your guild. 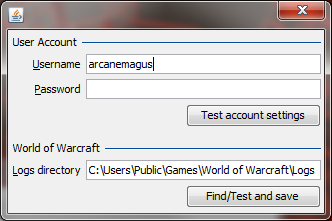 Fill in your WoL account information here and click "Test account settings". This will do a test login to verify that the credentials you entered are correct. When a valid login has been entered the information is saved and doesn't need to be changed unless you want to upload to a different account. The lower part tells the WoL client where your WoW log directory is. If this isn't filled in press the "Find/Test and save" button, locate and select the folder. Once this has been entered you shouldn't need to change it. Now that things are all set up and running, let's move on to how to actually use the client. The WoL Client provides 3 different options for uploading a log. Open a file: This option brings up a file selection dialog that allows you to select an arbitrary file for parsing and uploading. This is useful if you need to re-upload a previously submitted log for any reason, among other uses. Open the WoW Log: This option automatically selects WoWCombatLog.txt in the configured log directory. Start a Live Report Session: This will start watching the WoWCombatLog.txt file and upload changes to the server as it sees them. Note how at the bottom of the window it shows the currently logged in user. This provides a nice check as to whether you are properly logged in, and to what account the client currently is set up. If you want to upload to multiple guilds simply change the login in the client before uploading a report. This way you can have a personal guild for pugs or whatever you want. Congratulations, you now know how to use the WoL client! So you have read through all the steps above... but things still aren't working quite right? Here are a few common problems that people have. There are a few different reasons for this that people ask about all the time. The most common is that people haven't installed Java. So if you haven't installed it... do so now! If you aren't sure, install it anyway as this will make sure you have the latest version. If these don't get the client running, your local cache may possibly be corrupted. 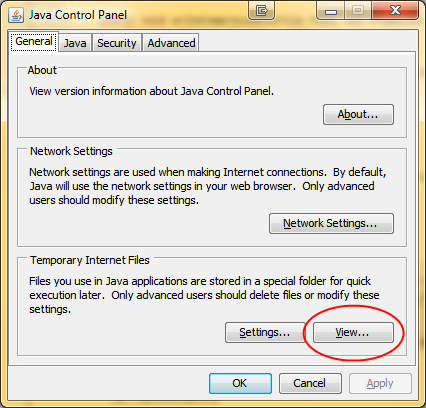 Open the control panel -> Java (you may need to search for it) -> Temporary Internet Files -> Settings -> Delete Files. One of the most common things seen is logs being uploaded to the "wrong" guild. If this is happening to you please check the login of the client as it doesn't follow the website. Check your login credentials as shown at the end of the Launching the Client post. In the WoL client click on Tools -> Split & zip logs. Select your WoWCombatLog.txt. The program will split the log up whenever it finds a gap in time of inactivity. I believe the gap must be at least 20 minutes with no log lines. A folder called "archive" will be created in the same directory as the log file, inside this folder will be zip files named YYMMDD HHMMSS.zip, with the time stamp based on the first logged line in there. To use this to upload after splitting it up simply extract the zip files in the log directory and tell the client to upload the .txt files that are created. Each file should be usable in the client. Debug text and any errors will be printed to this screen as the client does it's work. After enabling the console try to reproduce your error and copy the text from the console to a post on the forums. A copy of the raw log file you are working with might also be helpful. If you can try to keep it around until the problem is fixed. One thing that might help if you use the client a lot is being able to "install" it. 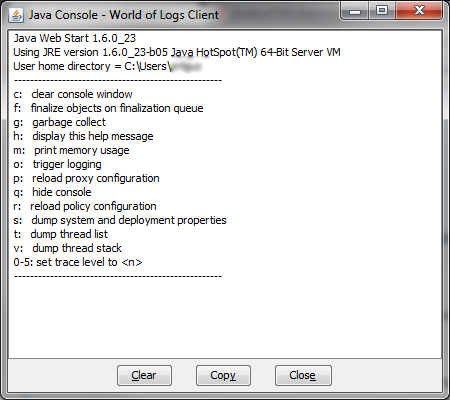 Once you have ran the client at least once you can do this by opening the Java control panel -> General tab -> View... in the Temporary Internet Files section -> Select World of Logs Client -> Install shortcuts. This will put a shortcut to the client on your desktop and the client will be kept up to date for you. 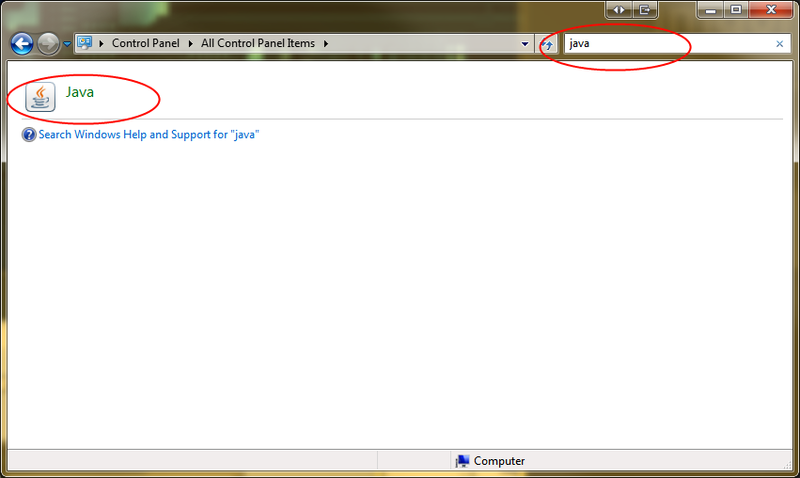 Go to Control Panel, use the search on the upper-right to search for Java. On the General Tab, click View at Temporary Internet Files. 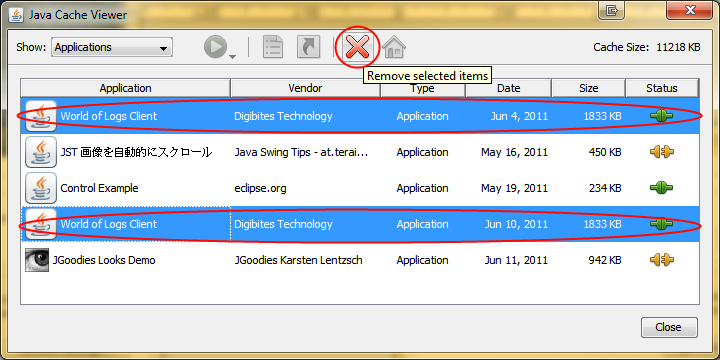 Then, select all instances of the World of Logs client and click Remove selected items. 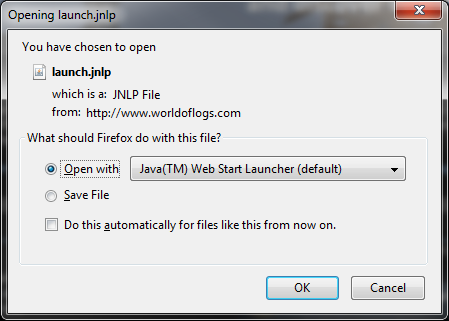 If clicking the Client link on http://www.worldoflogs.com does not launch the client, you may need to restore the file association for the JNLP launcher file type. NOTE: Make sure to select javaws.exe (i.e. ending in "ws"), not javaw.exe or java.exe! Confirm twice, then close the remaining windows. Try launching the Client again. 3) Change the setting to Direct connection, then click OK, and OK again. 4) Launch the client from the WOL website link. This setting changes the system-wide proxy settings for Java. Instead of connecting through the default proxy server ("use browser settings"), you're telling Java to connect directly to the internet.